Neoliodes sp., copyright Walter Pfliegler. The Neoliodidae are a group of relatively large mites in which the adults carry several scalps (shed cuticles) of earlier nymphal stages. 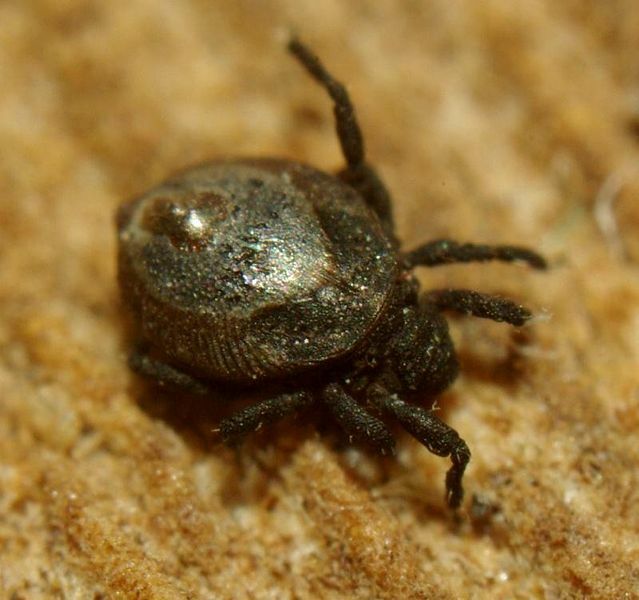 Historically, this family has been known as the Liodidae and its type genus as Liodes but names were replaced due to a belief they were preoccupied by the beetle genus Leiodes; though Liodes was not actually preoccupied (owing to the difference in spelling), the replacement was later formalised by declaration of the ICZN. Characters (from Norton & Behan-Pelletier 2009): Large mites (1000–2000 µm), heavily sclerotised, bearing concentric nymphal exuviae. Apodemato-acetabular system abnormal, variable at the genus level. Dorsophragmata and pleurophragmata absent. Leg segments with saccules or brachytracheae. Genital plates with transverse scissure, with seven or eight pairs of setae. Preanal organ with brachytrachea or platytrachea. Lyrifissure ian present. Palpal eupathidium acm separate from solenidion; seta d present on tibiae and genua when respective solenidion is present. Tibiae of legs with (Platyliodes) or without retrotecta. Immatures with platytracheae or brachytrachea; larva unideficient. Nymphs eupheredermous, multideficient, with maximum of six pairs of opisthonotal setae; setation of protonymphal leg IV normal (0-0-0-0-7) or variable at genus and species level. [G34] Grandjean, F. 1934. Les organes respiratoires secondaires des oribates (acariens). Annales de la Société Entomologique de France 103: 109–146. [G45] Grandjean, F. 1945. La signification évolutive de quelques caractères des acariens (1re série). Bulletin Biologique de la France et de la Belgique 79 (4): 297–325.